Opera is stepping up its game in a big, bold way. 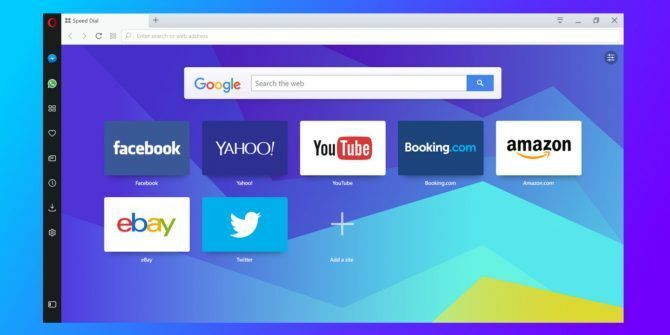 Having already added a built-in ad-blocker and a free VPN 8 Opera Features You Should Start Using Today 8 Opera Features You Should Start Using Today Let's explore eight of the best Opera features that will make browsing smoother and more convenient for you. We bet you'll want to start using them right away. Read More to its web browser, Opera is now changing things up once more. The company considers these changes innovative enough to justify giving the latest release the codename of “Reborn”. Opera Reborn, or Opera 45 to give it its less evocative name, is Opera’s latest attempt to reinvent the browser. Reborn introduces a new user interface, light and dark color themes, cleaner icons, performance and security improvements, and several new features. The most obvious new feature is the integration of three popular messaging services: Messenger, WhatsApp, and Telegram. These are now baked into the browser, and always accessible via the sidebar. Which means that you can keep chatting with friends while you browse the web. To enable a messaging app in Opera, just click on its icon and enter your login credentials. You can then use it in overlay or pin it next to your current tab. Either way, this provides fast and easy access to your messaging app of choice right from within your browser of choice. Opera 45 is available for Windows, Mac, and Linux right now, or you can wait until your current Opera installation updates automatically over the next few days. Either way, you’re in for a treat. It should be noted that Opera Reborn has borrowed heavily from Opera Neon, the experimental browser Opera teased us with Opera Neon Reveals the Future of Web Browsers Opera Neon Reveals the Future of Web Browsers Opera has launched a brand new web browser called Opera Neon. This is a concept web browser designed to offer a tantalizing glimpse at the future. Read More back in January. Reborn may not be as innovative as Neon, but it certainly feels like a step along the road towards a brave new future for the humble browser. Do you currently use Opera as your main desktop browser? If so, what do you think of it? And what makes it better than Chrome, Firefox, Edge, and Safari? If not, why not? Are you likely to try Opera Reborn? Or does it not appeal? Please let us know in the comments below! Explore more about: Facebook, Instant Messaging, Opera Browser, Telegram, WhatsApp. I think Opera is doing a real good job! It's fast like Chrome but more customizable. Opera also has a really good free unlimited VPN services and an integrated always better Ad block. Last updates are really good, the chance to add Messanger, Whatsapp and Telegram chat in the sidebar is great. Opera and Chrome scored the same at HTML 5 test. The only problem is that in setting, under User interface, you can flag " Use the system color for the top bar". I suppose that now the top bar can have the same color of system, like in Chrome on Win 10. To me, even if i reboot the browser, the top bar is still of the default color of Opera. Anyone can try to change this option and sees what's going on? I'm pleasantly surprised that I can use WhatsApp inside Opera. Have been using Opera as my main web browser for two years now. I only have good things to say about the very competent app.